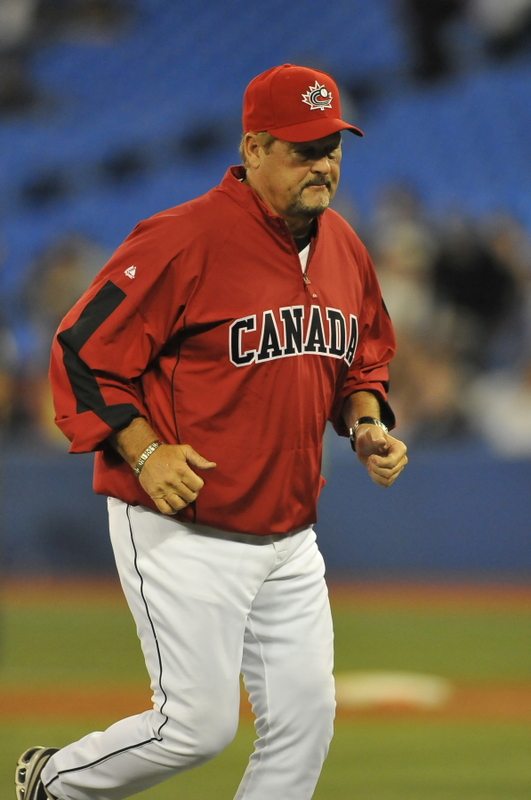 Ex-Blue Jay Ernie Whitt is one of the quality people involved with Baseball Canada. (Photo courtesy of Canadian Baseball Hall of Fame). – I continue to ask everyone to please keep former Montreal Expo catcher Joe Siddall and his family in your thoughts and prayers. Joe’s 14-year-old son, Kevin, was diagnosed with blood cancer in August and is fighting for his life. – I always feel better about the state of humanity after I attend Baseball Canada’s annual National Teams Awards Banquet. The quality of people involved with the Baseball Canada program – from Ray Carter to Jim Baba to Jason Dickson to Greg Hamilton to Ernie Whitt to Adam Morissette – is outstanding. And when you speak with alumni members like Chris Reitsma and Pete Orr, who remain devoted to the program and its direction, you have to feel good about the future of baseball in our country. – There has been much discussion about the National Baseball Hall of Fame’s 2014 inductees, which were unveiled on January 8, but baseball fans can also look forward to the Canadian Baseball Hall of Fame announcing its new electees in early February. Some have asked if the recently retired Roy Halladay is eligible for enshrinement. Canadian Baseball Hall of Fame inductees must wait three full years after their last pro game, so Halladay won’t be eligible until 2017. – If you think A-Rod is a scumbag, you should read Christopher Frankie’s book about Lenny Dykstra (“Nailed: The Improbable Rise and Spectacular Fall of Lenny Dykstra”). The book paints the scrappy, former leadoff hitter, who almost single-handedly defeated the Toronto Blue Jays in the 1993 World Series, as a narcissistic fraudster who allegedly stole money from his employees, used steroids and other illicit substances and committed indecent acts against women. Dykstra, who was released from prison last June after spending more than a year behind bars for bankruptcy fraud, has been embroiled in a feud with Mitch Williams ever since the former Phillies closer allowed the World Series-winning home run to Joe Carter on October 23, 1993. The book reports that right after the homer, Dykstra walked by a dejected Williams and muttered, “Guess there won’t be a Game 7, will there?” In various interviews since 1993, Dykstra has blamed Williams for the Phillies’ Fall Classic loss, claiming that by allowing that home run, Williams has put him (Dykstra) through “torture.” He has also referred to Williams as a “barrel finder” insisting that his pitches always seemed to find the barrel of players’ bats. All of this led to a confrontation between the two that was briefly caught on video at an autograph event in November. – Now that Jason Bay (Trail, B.C) has said he’s going to retire and Jeff Francis (Vancouver, B.C.) has inked a minor league deal with the Cincinnati Reds. Left-hander Erik Bedard (Navan, Ont. ), oft-injured right-hander Rich Harden (Victoria, B.C.) and Pete Orr (Richmond Hill, Ont.) are three Canadians that remain unsigned. There have been no reports linking the taciturn Bedard to any big league club. On Friday, I sent a note to Harden’s representatives at Wasserman Media Group to get an update on whether he plans to continue his career, but I haven’t received a response (I’ll keep you posted). I spoke with Orr last Saturday and he told me that he would like to continue his playing career, but he’s not closing the door to beginning a coaching career. – There’s no doubt that Roy Halladay’s name and number will soon be added to the Toronto Blue Jays’ Level of Excellence at the Rogers Centre – and rightfully so – but I still maintain that Tom Henke’s name and number belong up there. Blue Jays fans were told at the club’s “State of the Franchise” event in February 2012 that Henke was being considered for that honour, so I’m not sure what the holdup is. – Happy 24th birthday to Toronto Blue Jays sparkplug third baseman Brett Lawrie. It’s hard to believe that the fiery Langley, B.C., native is now entering his fourth season with the Jays. – If you haven’t already done so, please “LIKE” the Cooperstowners in Canada Facebook page. I update this page regularly with links to Canadian baseball stories. Thanks again for all your support. Thanks for this update on baseball in Canada. My thoughts go out to the Siddall family. Thanks for the comment, Steve. I’ll try to keep everyone posted on Kevin Siddall. Unreal about Dysktra. I knew he has been battling with his personal demons, jail etc…but didnt know the behind the scenes with Williams. Below the belt stuff there. Thanks for the comment, Devon. A-Rod seems like a saint after reading this book about Dykstra.